As per the previous announcements on the AREG website, there will be a (small) balloon launch occurring this weekend. The current predictions for Sunday have the payloads landing to the south-east of Mannum (hopefully not in the river!). Currently the prediction for Sunday looks the best in terms of recovery/distance/bakery factor, and also leaves Saturday free for some last-minute preparations! As usual, we’ll aim to launch around 10AM CDST, with the launch being conducted from the Mt Barker High School Oval. This will be a fairly low-key launch, with a tiny balloon and tiny payloads, but visitors are still welcome! We’ll be on-site from around 9-9:30AM, and should have an ear out on VK5RSB 70cm. The current prediction (noting this will probably change between now and Sunday!!) has us landing near Palmer just after 11AM – a very short flight! We’re using a 100g Totex balloon, so the expected burst altitude is only 11-12km. UPDATE: We will now be using a 1000g Hwoyee balloon, but with a minimal amount of helium. Depending on what ascent rate we achieve, we may terminate the flight early for a landing near Mannum, or let it ascend to a potential height of 35km. Either way, the landing area is in the Mannum area. The auto-configure capability for the RTTY payload (‘HORUS’) will work as usual, however you will have to manually select ‘HORUS’ from the payload drop-down list. 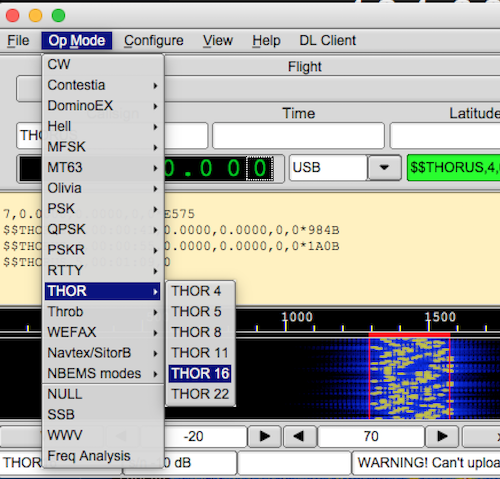 Auto-configure will not work for the THOR16 payload. Images and comments from the chase will be sent via Twitter, using the #horus48 hashtag. This entry was posted in Horus by VK5GR. Bookmark the permalink.